Bailed-out insurance giant American International Group (AIG) said on Friday that it posted a third-quarter net loss of $2.4 billion, or $17.62 a share, as several large restructuring-charges totaling $4.5 billion offset growth in its insurance business. A year ago, the company earned $455 million, or 68 cents a share in the third quarter. AIG, as it previously disclosed, said the sale of a majority stake in American General Finance to Fortress Investment Group (FIG) led to a $1.9 billion pretax loss. The insurer also took two charges of $1.3 billion each, for goodwill and deferred taxes. On an adjusted basis, the net loss for the latest third quarter was $200 million, or $1.47 a share. Very few analysts projected earnings, and according to Thomson Reuters, they estimated AIG would actually post earnings. Meanwhile, third-quarter loss from continuing operations, meaning at units the company is keeping, narrowed. The loss from continuing operations was $47 million compared with a loss of $109 million a year earlier. "We were extremely pleased to announce a few weeks ago our plan to repay the U.S. government," said President and CEO Robert Benmosche. "We will continue with our aggressive plan to close pending transactions in order to repay the FRBNY in full, and provide for the exit of U.S. Treasury ownership over time." He added, "Importantly, however, as we accomplish these critical steps in the restructuring, AIG's continuing insurance operating results remain solid, with $2.1 billion of pre-tax operating income generated in the quarter by Chartis and SunAmerica Financial Group." 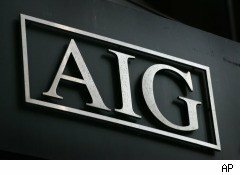 AIG, which got over $182 billion from the American taxpayer during the height of the financial crisis, said last week it got a combined $37 billion by divesting AIA Group and American Life Insurance. It plans to use the money to repay the New York Federal Reserve bank and continue repaying the government under its announced exit plan. Treasury, which will own 92.1% of the New-York-based company after the conversion of preferred shares, will then sell its common stock in phases.